Michael Jackson’s Hair Loss – What Happened to his Bald Spot? Belgravia Centre Hair Loss Blog > Blog > Alopecia > Michael Jackson’s Hair Loss – What Happened to his Bald Spot? The King of Pop once wore a very different crown and almost had it taken away. It’s hard to believe that Michael Jackson once sported a full afro and everyone’s probably also forgotten that he nearly went bald at 25 after a freak fire accident. While filming a Pepsi commercial in 1984, pyrotechnics accidentally set Jackson’s hair on fire. He was rushed to hospital and treated for second degree burns to the back of his head which scarred his hair follicles and left him with a major bald patch. When hair-bearing skin is badly burnt, the hair follicles are destroyed and replaced by scar tissue. The hair loss is permanent and known as cicatricial (or scarring) alopecia. Jackson was singing his hit “Billie Jean” in a simulated concert scene when the special effects went wrong. Three thousand fans saw a firework display erupt behind the superstar, showering him in sparks and setting light to his hair. Jackson covered his burning hair with his jacket but some audience members thought it was part of the act. Jackson later underwent 80 minutes of laser surgery to repair his scalp. His surgeon Dr. Steven Hoefflin, famously known as “Doc Hollywood” who Jackson formed quite an attachment to over the years, said he was able to stitch the wound without having to implant or transplant hair from other parts of Jackson’s head. According to Leonora Doclis, senior trichologist at the Belgravia Centre, while laser surgery can make the scar smaller, it won’t help in generating hair growth from the scar. This begs the question then – what happened to Michael Jackson’s bald spot? Interestingly, the same surgeon who treated Jackson’s hair loss is responsible for Donald Trump’s combover. He performed scalp reduction surgery to reduce the size of the business mogul’s bald spot which he now covers with the rest of his hair. Cicatricial alopecia is a broad term that includes all forms of hair loss concerning inflammation directed at the hair follicle. “There are several reasons for scarring hair loss. Scalding is just one and there is an autoimmune factor,” Leonora says. In addition to burns and other injuries, cicatricial alopecia can be caused by certain types of infections like granulomas, lupus erythematosus, recurring bacterial or fungal infections, a skin disease called lichen planus, and scalp ringworm. The progression of cicatricial alopecia as the result of an internal problem is unpredictable but hair loss is irreversible once the follicle is destroyed. Leonora says autoimmune suppressant steroids could be injected but they won’t prevent or treat hair loss. Minoxidil, a vasodilator, may be helpful to stimulate any small, remaining, unscarred follicles but the effectiveness vastly relies on the strength of the medication required by the individual and the damage done to the hair follicles. Despite Dr. Hoefflin’s claims that Jackson’s scalp would be completely healed within several months, Leonora has her doubts over the authenticity of Jackson’s hair. As for his dramatic transformation from typical afro hair to the sleek style he now brandishes, Leonora says chemical straightening could be responsible, if it is indeed his real hair. Cicatricial alopecia, whether internally or externally provoked, is a frightening and distressing condition. Diagnosis and treatment is often challenging so a consultation with a hair loss specialist is absolutely essential. Treatment for other forms of hair loss such as male or female pattern (genetic) hair loss, and alopecia can be very successful. 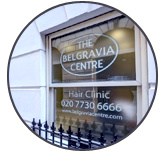 For more information contact the Belgravia Centre, the UK’s leading hair loss clinic, on 020 7730 6666 or send an email. Back then, hair wasn’t Michael Jackson’s only concern – he’d already had two nose jobs by the time he was 25 and went for his third rhinoplasty shortly after the hair loss incident. From then on his visits with Doc. Hollywood became ever more frequent.